Professor Malcolm Potts believes two existential questions will dominate the lives and careers of today’s undergraduate students as the 21st century progresses. "First, can the global economy move become biologically sustainable by the end of this century, without irreversible damage to the fragile biosphere on which all life depends?" he asks. "And second, will the continual exponential growth on which the U.S. economy is predicated crash in the coming decades? What will this crash look like?" With the goal of preparing undergraduate students to face and begin answering these questions, Potts teamed up with Federico Castillo, researcher and lecturer in the Department of Environmental Science, Policy and Management, who specializes in environmental economics and technology transfer. Together, they developed a new undergraduate course: "Survival 101: Taking Control of Your Future." To pilot and evaluate their course, Potts and Castillo were awarded a 2015-2016 Presidential Chair Fellows Enrichment Grant by UC Berkeley’s Center for Teaching and Learning. The program provides an opportunity for a team of Berkeley faculty members to develop, improve, transform, and examine core areas of the undergraduate curriculum. It focuses on curriculum enrichment efforts that are meaningful and achievable. 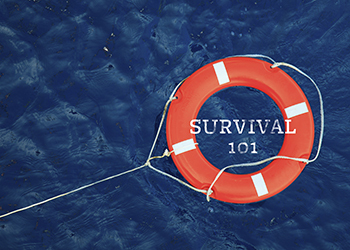 In Survival 101, undergraduate students will be prepared to understand and seek solutions to the unprecedented challenges they will confront during their professional careers, and over the rest of their lives. The pilot version of the course is cross-listed in the School of Public Health and College of Natural Resources. Part of the grant funds a Graduate Student Assistant Researcher to evaluate the course, and Potts and Castillo will participate in scholarly exchange with other grant recipient’s throughout 2015-2016. As they develop the course, they will aim to have it fulfill a breadth requirement for Berkeley undergraduate students. "Survival 101 will not be faculty lecturing students," says Potts, "but undergraduates as partners in exploring the great challenges of the next half century."